Vinegar is a permanent member of almost every household. We not only dress salads and noodles with it but also it is an essential pickle ingredient and a wonderful cleaning solution. But can you think of a medication use of it? Yes, the most famous vinegar – apple cider vinegar is equally famous for its therapeutic abilities. It controls diabetes, curbs obesity and keeps a tab on your cholesterol level. Know more health benefits of this fruit vinegar. Cure for runny and stuffy nose – Runny and stuffy nose is a sure irritation. It doesn’t let you concentrate on anything. And there are not many medications available which can offer you an immediate relief. How about taking a tablespoon of apple cider vinegar followed by a cup of tea? You might find this solution a little weird but it’s 100% effective. Apart from that, taking a spoonful of apple cider vinegar also helps you in soothing your sore throat. Helps in stomach borne problems – after a heavy lunch or dinner, you are finding it difficult to digest or suffering from the problem of bloated stomach, take a tablespoon of apple cider vinegar with a glass of water. You’ll find your problem to be vanished from the core. The medicine for diarrhea – Diarrhea is one of the highly neglected but most dangerous diseases. If not controlled immediately, it may lead you to severe state of dehydration. If you have a bottle of apple cider vinegar, you can control Diarrhea on its initial stage only. 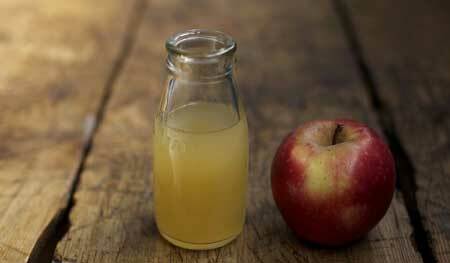 Add two tablespoon of apple cider vinegar in your favorite juice and drink it. You’ll experience an immediate relief. Energy booster – You want a good energy drink to beat the exhaustion of the day. Why to invest in costly energy boosters when a teaspoon apple cider vinegar diluted in chilled water can energies you in a jiffy. Apple cider vinegar is enriched with electrolytes which instantly energies you. Controls Blood Pressure – Potassium is one of the important elements of composition of apple cider vinegar. This element is known for its ability to regulate blood circulation which ultimately regulates pressure of the blood. Speeds up body metabolism – A slowed physical metabolism triggers numerous ailments such as poor digestion, weight gain, arthritis (due to slowed metabolism, metabolic wastes get collected in body tissue which causes arthritis). But if you take a spoonful of Apple cider vinegar every day, it’ll wonderfully increase pace of your body metabolism as well as throw the unwanted metabolic wastes from your body tissues out. This will help you in recovering from many diseases. Fungal infection medication – Rainy season is the most favorable weather for fungal infections. But with apple cider vinegar, you can immediately get a control over this. Mix vinegar in water and douche your affected body part. It’ll immediately offer you a relief. In Cutting Down Nighttime Leg Cramps – If your sleep often gets disrupted due to nighttime leg cramps, including apple cider vinegar in your daily menu can be very effective for you. Mix two tablespoons of vinegar and a teaspoon of honey in a glass of water. Drink this before you sleep, believe beautyglimpse, you won’t get up in night to complain about leg cramps. Note – If you are currently suffering from cramps, drink the solution. It’ll instantly cut down the pain of leg cramp. Maintains sugar level in the body – The effect of apple cider vinegar in controlling diabetes is well researched. Taking vinegar everyday can lower sugar level of the body from 4%-6%. Take it before you got to sleep to find a decreased glucose level in the morning. Kills Cancer cells – This is one of the most amazing heath benefits of apple cider vinegar. According to a few laboratory researches, this vinegar is effective to either kill cancer cells or slow down their growth. A bottle of apple cider vinegar is a bottle of magic. Keep it in your home to find a quick solution of many health problems.